• Classes commence with registration at 9.45am. One hour is set aside for lunch and classes finish at approximately 5.00pm. • On booking a 50% deposit of the course fee is required four weeks prior to course commencement to secure a position. All deposits are non refundable. The balance is to be paid on the first day of the course. • All courses are continuous. Students who do not attend courses due to illness or general absenteeism will not be entitled to a refund or transfer to another course (only exceptions being at the principal’s discretion). • All courses are subject to change at the principal’s discretion. • The Academy is closed on all UK bank holidays. • Student progress reports are available at the employers/ guardians request. • Diplomas of participation are awarded on completion of each course. • Students for all courses, with the exception of the Nine Month Diploma, are required to bring their own hairdressing equipment. 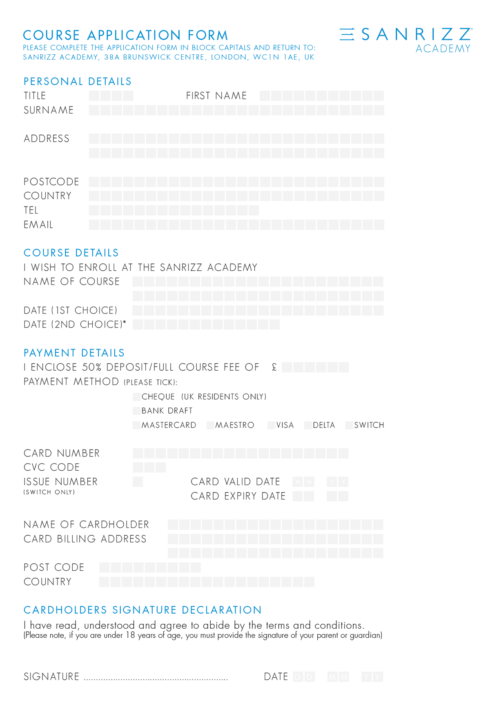 Alternatively, equipment can be purchased at Sanrizz Academy.